Whenever you hear "Gerber baby", you automatically picture a charcoal drawing of an adorable little baby face in your mind's eyes. Who is that original Gerber baby? There is no escape for the Gerber baby face household brand. It's the most popular brand of baby food products in the US. The history of the Gerber baby contest was an intriguing event in America. No one thoughts the winner will become an icon. Before it was made public of who is the Gerber baby was, there had been many speculations. The two most popular was actresses, Elizabeth Taylor and Jayne Seymour. Some were even under the impression that the baby Gerber was Sally Gerber, and even Richard Nixon. The most popular guess was Humphrey Bogart. There are good reasons for that. Maud Bogart the mother of Humphrey Bogart was a successful commercial illustrator. She did created many sketches of baby Humphrey and also made good use of it. So the connection is pretty obvious to most. If it's not him then who is the real Gerber baby? Gerber didn't start marketing and advertising baby foods until 1928. If so, then Humphrey Bogart was almost 30yrs old by this time. 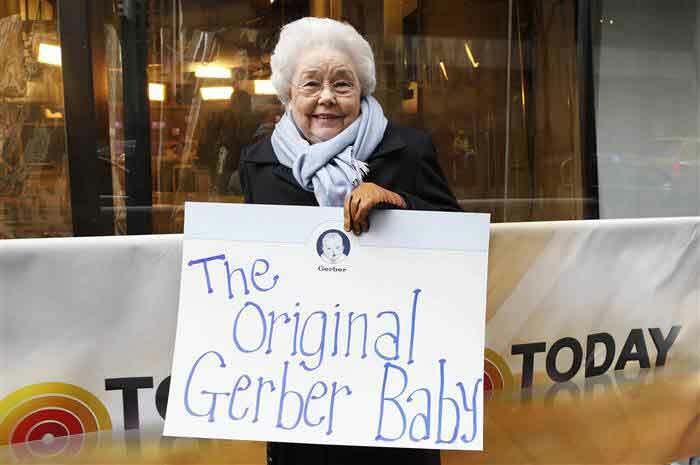 Let's Solve the Original Gerber Baby Mystery Now. A successful commercial illustrator by the name of Dorothy Hope Smith was the artist that responsible for the Gerber baby drawing. But, no. It's not her daughter. Dorothy was a neighbor of a cartoonist, Leslie Turner. The actual charcoal drawing was preliminary sketch by Dorothy of Mr. Turner's baby girl. 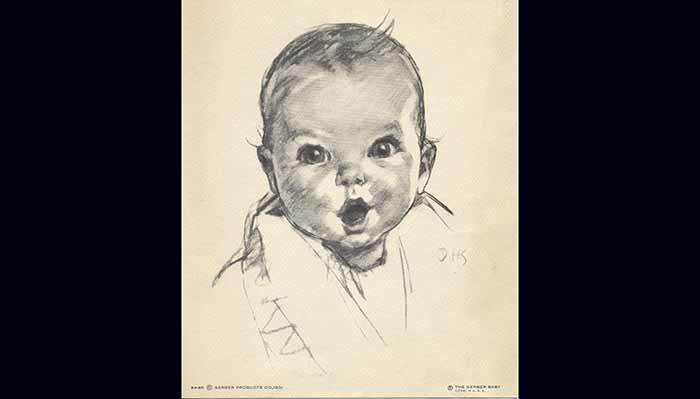 Back in 1928, Gerber launched a contest and invited artists to enter drawings of babies. It was Dorothy who submitted the unfinished charcoal drawing of 4 months old, Ann Turner Cook. Dorothy not knowing the consequence of how big it will become, she did won $300. And with that $300 cash she also gave up the rights to that drawing to Gerber. More confusions: Ann "Taylor" Cook? As if the discovering of the original Gerber baby model was not confusing enough. 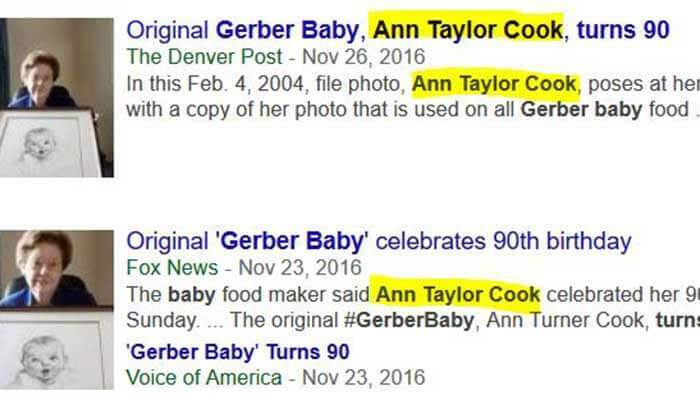 In November of 2016, the Associated Press ran a story that our beloved Gerber baby turns 90 years old with the name Ann Taylor Cook. That story got picked up by all the other news media outlets and they all ran the story reported. Did the Turners Get Anything for Being the Original Gerber Baby Model? Where they live it wasn't uncommon to use a neighbor's baby as a model for drawings, nobody think much of it. But that little action went on to make Ann Cook famous when her image was first started appearing on Gerber products in 1928. Then it went on to be the official Gerber's trademark in 1931. The fame of Ann Cook didn't officially belong to her and lingering until 1951 when Gerber paid Cook a $5,000 one-time cash settlement. The real star was Ann Tuner Cook, the "original Gerber baby" that everyone wondering about. Dorothy Hope Smith was paid $300 originally for the drawing, both her and Cook don't get any royalties for the use of that famous Gerber baby image. The Gerber contest went on to inspired many more Gerber baby contests. In fact, in 2010 Gerber launched their first annual baby contest. It's now well-known as the "Gerber Photo Search". Originally, the grand prize winner walked away with $25,000 college fund. That quickly turned into $50,000 cash prize and with many extra. There are also milestone category prizes as well for runners-up. The Gerber's baby photo search contests continue each and every year since then. There has been quite a few interesting winners. Mary Jane Montoya was the first Latino winner of this Gerber's baby contest. Levi & Paxton Strickland was the first twin winners. Isla was the first Asian Gerber baby. How to ENTER the GERBER Baby Contest 2019? Is Ann Turner Cook Still Alive? It's fascinating to see so many searching for: Ann Turner Cook died, Ann Turner Cook death, Ann Turner Cook age, and ??? Ann Turner Cook teenager? Interesting, right? America are intrigued to learn about the Gerber baby. Well, you'll be happy to know the Gerber baby is still alive. As a matter of fact, she just recently celebrated her 90th birthday. 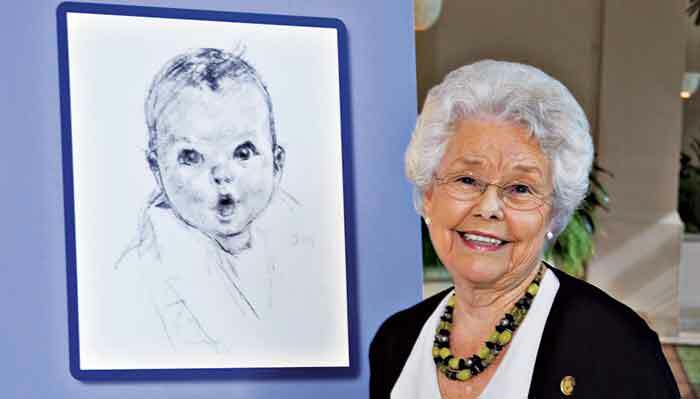 UPDATE: Today our beloved Ann Turner Cook—the Original Gerber baby is 92 years young. Who is Ann Turner Cook? Students described her as "a teacher who really communicates with the students" and who, "without any complaints . . . has stayed late, worked nights, and with quiet efficiency supported her staff in their monumental task". Ann Turner Cook was an English teacher. She earned a master's degree in English education and several other degrees as well. Ann studied education and English journalism. All these added up and made perfect sense that she choice a career of teaching in the subject of English. And after retired from teaching, she became a novelist mystery writer. Some of her works include; Micanopy in Shadow, Homosassa Shadows, Shadow Over Cedar Key, and Trace Their Shadows. How much does the Gerber baby make? According to Celebrity Net Worth, our Gerber baby net worth or now as we all know who she really is—Mrs. Ann Turner Cook net worth is $2 millions.